The count down begins, Grenada Sailing Week is only two weeks away. With 39 entries and counting, the racing fleet is shaping up nicely. We have 13 entries in Racing Class, 11 entries in Racer Cruiser, 8 entries in Classic Class and 7 entries in the one design J24’s. Grenada Sailing week is excited to announce their support of the first youth sailing team to join the J24 class. The Grenada Sailing Association National Youth Sailing Team is a new team made up 16 to 20 year old’s. Prior to this they sailed on Optimists and Lasers at the various sailing clubs around the island (Gouyave Sailing Club and Woburn Wind Warriors). This is a huge step for them to progress into J24 sailing, helping to bridge the gap between dinghy and keel boat sailing. This program is supported by Grenada Sailing Association, Caribbean Sailing Association, Grenada Tourism Authority and Glenelg Spring Water. The team is coached by Robbie Yearwood of Team ‘Diehard‘ another J24 owner and Kevin Banfield, the GSA Olympic & World Sailing trained coach. In order to help raise funds for the youth team, we will hold raffles throughout the event. We will also be showing the award winning film ‘Vanishing Sails’ at 6.30 pm on lay day Wednesday, with a $10ec voluntary donation. The Grenada Sailing Association is a non profit organisation and is grateful for any contributions towards the youth sailing team. Please contact a member of Grenada Sailing Week if you would like to make a donation. On the island of Carriacou in the West Indies, the last wooden sailboat builder dreams of saving a great tradition passed down the generations from Scottish settlers that sailed there centuries ago. 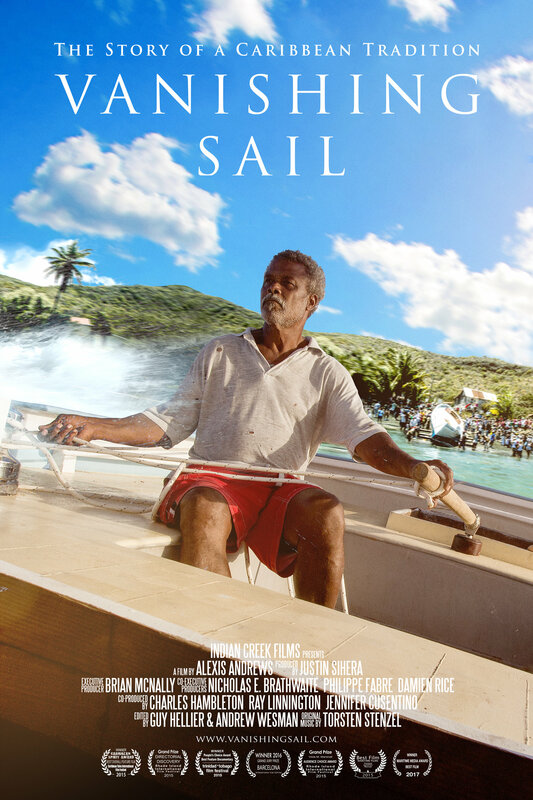 The film follows Alwyn’s journey over three years, while stories of the old Caribbean – trading by sail and smuggling contraband interweave a tribute to the independent spirit of a small island community.